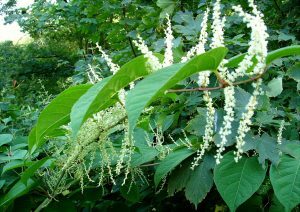 Sometimes referred to as “Godzilla weed,” Japanese knotweed is one of the most invasive and hated plants on Earth. It grows through freeways and building foundations, destroys property values, and is even illegal to plant, transport or dispose of improperly in many countries. It’s also one of the most medicinal plants on the planet, containing more of the polyphenol resveratrol than any plant we know of. Used in Chinese and Japanese medicine for over 2000 years, Japanese knotwood is used today to treat cardiovascular problems, cancer, diabetes and Alzheimer’s. In addition to being a rich source of minerals and vitamins, it’s prized component resveratrol has been the subject of hundreds of medical studies in recent years. Resveratrol is a powerful antioxidant that thins the blood and clears blockages in the arteries, helps with oxidation of fats and fat metabolism, and has anti-bacterial, anti-viral and anti-fungal properties. Japanese knotwood is also one of the only effective remedies for Lyme disease, pulling the bacteria out of the nervous system. Knotweed is a highly prized mountain vegetable in Japan and China, Willard says. He recommends pickling the shoots with magnesium salt to get rid of oxalic acid before eating. He’s nicknamed the resveratrol in its roots “reverse-it-all,” as its known for reversing so many ailments and signs of aging. It’s not coincidence that invasive weeds grow wherever humans have disturbed the soil, Willard says, noting that knotweed doesn’t grow in the forest. Holy moly, isn’t that always the way – just when you think something is such an evil curse, only to find out that, of course, it has amazing life changing properties! We have to go back to when people lived in harmony with mother nature. We have so much to learn! Thank you for this wondrous information. WOW! Wonderful information, thank you so much… I take Resveratrol, and take good care of my health/diet..
How do you take (pill vs. it tincture) it and how often? Could you please email me your answer? Could you please choose a click-bait photo with only ONE plant species in it? The foreground shows the main parts of JKW. Floweres, leaves,stem. There is another embeded which shows young plants growing. Agree with Diane. The knotweed is displayed prominently. Doesnt always grow alone. And you didnt have to rudely lable it “clickbait”. Its part of the information. Geezzz…..get a grip! LOL, no mention of how light harvesting causes this plant to spread quickly underground in defense. This is one of the most difficult plants to remove once established, with roots 9′ deep, and spreading as much as 30′ underground. Tiny pieces of it that are composted or discarded can make new colonies. Know thy plant…well, before you even think about planting it. This one should be illegal to plant. Why would you want to get rid of a plant that can do so much good? Over growth would be a good thing. I swear. You stick the word weed on something and everyone just makes it evil. Becky- this and similar plants displace native plant communities, or space that could be used for native plant communities which we actively do with lawns and ornamental landscapes. The reason this is so bad is that species are going extinct at an alarming rate. Many pollinators are specialists meaning they depend on a certain species of plants in order for survival. Some insects are even regionally specific, on a molecular level, as far as which plants they recognize as food. A good example if this is the monarchs butterfly whose larvae depend exclusively on milkweed, and the butterflies need nectar sources throughout the season. I am not saying that the knotweed is inherently bad as we do need food and medicine but I am saying that just because it benefits humans does not make it good. If you are interested in learning more on this subject than I really recommend ready Bringing Nature Home by Doug Tallamy. There is a time and place for everything. It is not native to N. America so it disrupts our ecology. It has a purpose but not here. It’s about containment… this plant destroys infrastructure. Because it takes over whole habitats and crowds anything native out of existence. You don’t appear to have any personal experience of the damage, both physical and environmental, that this plant can do. It is illegal to plant. But who needs to plant it in their backyard when it is so prevalent in the wild? If I decide to try this, I will be harvesting it from the creek near me. It is pretty rare in Kansas as it hasn’t moved here yet. There was a bunch around my neighborhood in West Michigan and the county is killing it. OMG. I think they missed a piece in my yard. Thinking of digging it up in the spring and planting in a large container, to contain it. Herbalist Yarrow needs to learn a little more about ecology in North America before he says, “we need plants like these..” and goes on to call the necessary effort to control JK an agro-destroyer mentality. We complain about how easy the plant spreads but if we harvest it and use it instead of killing it then we are rewarded with health. Free food and vitamins for all. It is best when small and new shoots. But farms would love a renewable plant so easy to grow if they were selling it. Make sure the plants you pick for use havent been treated with roundup in the past. The plant chokes out other plants. Known as,an invasive species, it will take over. Look for wild plants, please, your environment will appreciate it if you don’t spread it around. I’m sure it grows naturally somewhere. Let them make the juice. There is no way anyone should encourage this plant by disturbing its roots or leaf bits. I use it RA…..it works treat. They wanted me to take methotrexate, glad I found this stuff. What is a safe dose to take daily of this? It generally does not seed in Ireland so takes a long long time to make a nuisance of itself. Just don’t cut it. The fallen bits will turn into new plants. The honey bees love this plant as well as deer. I will say be careful of where you sample this plant because it has been “round upped” to death by highway crews, right of way crews and farmers. Japanese Knotweed has been a gift for many we know and us to treat lyme. 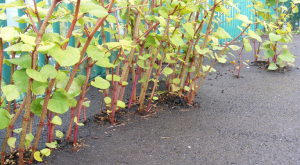 The reason this plant is called knotweed may be because of the regular knot like joints along the stem, but more likely because of its rock-like roots. Like gnarled fists a foot down, made of hair, root, sand and stone. I’ve worked with every medicine and food plant in my part of the world and I can tell you I’ve never had such a challenging root mass to deal with. Where the rhizomes are quick and easy to harvest, clean and cut up, the central root mass of each large plant can take an hour to harvest and fully process. But even as I was wrestling out these giants from the black earth, I sensed the effort was going to be worth it. I could feel that in their massive root was the heart of their great strength. And indeed when I began to process the roots to make tincture later, I found the orange coloured skin on the older rhizomes was many times thicker then the younger rhizomes. And the skin on the old hairy main root was many times thicker than that. Inside the bear-like black mat, the skin opened bright as the setting sun and thicker than rawhide. It was at least ten times as thick a what I had been harvesting (and effectively using) for years. The skin of the roots is where most of the medicine resides. I agree with Aleta. This plant does destroy ecosystems, but as others have said, it could easily be collected in the wild. Par-boil, as in partially boiled, not paraboil. Just a thought. If it is so valuable Inwoukd love it if someone could eradicate it from my property. It has completely taken over and has rendered 3/4 of my 1 acre unusable. The more you try to manage it, the further it extends. Has decreased my property value greatly. Oh my nerves! I found this fascinating and would love more information. I know I have seen knotweed on some of my walks in the woods where I live and will probably pay more attention to where they are so I can make a tincture. Documentation of information is important. Please consider showing references in your articles. I have had a large patch of this in my backyard for 15+ yrs. I keep it contained by mowing it down when it spreads to the grass. I have used it as a screen to block my debris pile (sticks & such). Since this property has been organic, I’m going to try making the tincture & will harvest the spring shoots to boil. Love your videos & insightfulness! Thank you! My dog was eating those berries. I understand now why..